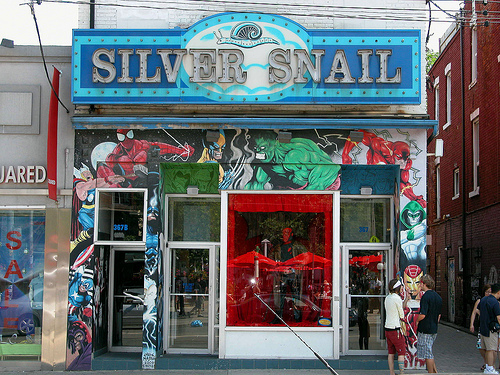 Toronto's Silver Snail has been a fixture on Queen Street West since it was established back in the mid-1970's. Toronto.com has the scoop on some old news that hasn’t been publicized elsewhere: that owner and founder Ron Van Leeuwen of the Silver Snail (established in 1976) was retiring and has sold the Silver Snail business to the Snail’s manager George Zotti and his business partner Mark Gingras. Van Leeuwen owned and has also subsequently sold the building that currently houses the Silver Snail to another party and the article points out that the new owners George & Mark need to relocate the physical business to another part of the city – away from it’s Queen Street West home of 33 years. The article gives a deadline date of February 2012 for that move. This entry was posted in General Announcements, Media, Retailers by Kevin A. Boyd. Bookmark the permalink.